Rarity and Value: These typically aren’t prohibitively scarce. However, they usually do represent the earliest bank notes that are available from most institutions. A very generic note could be worth as little as $400. Notes from rare banks could be worth several thousand dollars. The best of the best could sell for more than $10,000. Contact us for details. Don’t forget to check the serial number. Number 1 notes always sell for nice premiums. 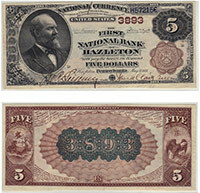 We buy all antique paper money issued by The First National Bank of Fall River, MA. We can tell you how much your $1 bill is worth. We aren’t just dealers. We are also collectors, experts, and appraisers. We have contributed to numerous price guides and are considered specialists in the field of national currency. Contact us via phone or email to get your free appraisal today.